When I came into work this morning I noticed something odd. There is a fly though feeder right outside the front door to the nature center and something was different about it. There was a nest inside. I hadn't noticed it at the end of last week and when I talked to staff who had been there on Saturday they hadn't seen the nest either. I quick look confirmed that it was indeed the nest of an American Robin. There were robins hanging around the feeder on Saturday so they were probably just starting to build. I'm amazed how fast they put this together. According to The Birder's Handbook: A Field Guide to the Natural History of North American Birds , both the male and female work together to make the nest which could account for how quickly it was built. The female lays between 3 to 7 eggs with 4 being average number. The eggs are incubated between 12 and 14 days and the birds fledge from the nest 14 to 16 days later. What a great location. Robins have adapted very well to human structures but this one seems pretty ideal. It even has a roof and a great view. 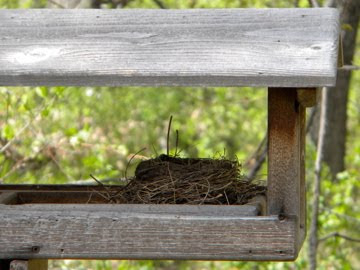 It is tempting to make some joke about nesting close to food seeing as how the nest in literally IN a bird feeder but baby robins eat insects and adults dine on larger items such as berries and works. It will be fun to monitor the nest and watch the young birds fledge. I used a mirror to look in the nest today and there weren't any eggs yet. The mud was still wet. This nest is about 15 feet from our active Eastern Phoebe nest which we have a nest cam on. It will be a fun spring watching these two nests. I'll keep people posted on this one as well. Perhaps that is a sign to fill your feeders more often. Yeah, this feeder isn't near our main feeder area and it doesn't get filled as often, especially in the spring/summer.